Anglesey is the first port of call on our Anglesey and Wicklow Tour. The Isle of Anglesey, North Wales, is quite often referred to as the Island of Romance and Wicklow as the "Garden of Ireland." Put these two together and you have one amazing tour. 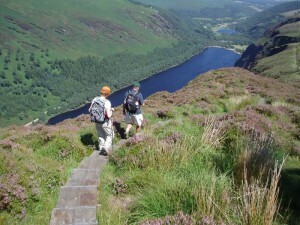 Wales Walking Holidays have joined up with their friends at Footfalls, Ireland, to offer this amazing walking holiday. There is a strong link between Anglesey and Wicklow via daily ferries which cross the Irish Sea. Wales Walking Holidays are agents for both Stena and Irish Ferries, so your ferry tickets will be included in your package price. Start your Anglesey and Wicklow walking tour in Wales or Ireland as the package is easily reversible. Anglesey is rich in mystifying history - standing stones, burial chambers and hill forts. It is a platform for amazing views over to Snowdonia and the Llŷn Peninsula on the mainland. 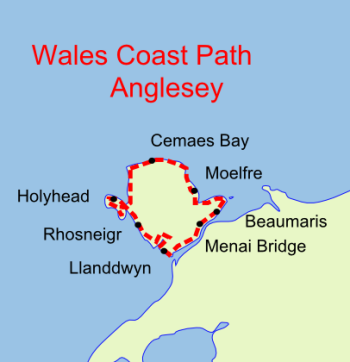 Anglesey has a 128 mile Coastal Path, which is part of the 870 miles Wales Coast Path. The path consists of cliffs, dunes and long sandy beaches, which are natural habitats to a variety of wildlife, flora and fauna. 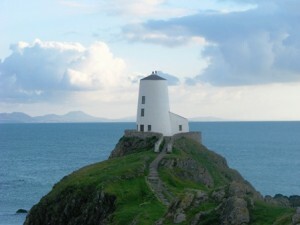 Ninety per cent of the Anglesey Coastline is designated as an Area of Outstanding Natural Beauty. Wicklow, deservingly gains the title “Garden of Ireland”. The Wicklow Way, Ireland, offers its visitors everything, from a wild and scenic mountain landscape made up of domed heather clad mountains, to deep wooded glens, meandering streams, waterfalls and tranquil lakes. Wicklow Way's finest jewel is Glendalough, situated in the centre of the county, and home to one of the finest Monastic Ruined Cities that you will find anywhere in Europe. The settlement was originally founded by St. Kevin, who is said to have built his first church on the west coast of Anglesey near Aberffraw (Eglwys Cwyfan Church out in the sea), before moving to Glendalough. Hence, one of many Anglesey and Irish links! DAY 1 Arrival to Bangor (North Wales). Meet and greet and transfer to first night's accommodation on the Isle of Anglesey in the south of the island, probably in the Llanfairpwllgwyngyll area. DAY 2 Transfer to Malltraeth, walk to Llyn Rhos Ddu including Llanddwyn Island. 7.5 miles easy walking. From Malltraeth cross the cob into Newborough Forest, now a natural habitat for red squirrels. Cross to the magical island of Llanddwyn, dedicated to Dwynwen, the Welsh patron saint of lovers. Make your way along the sandy beach to Llyn Rhos Ddu. Rest your weary legs with a welcoming drink at the renowned Marram Grass Café and Restaurant whilst waiting for your transfer. DAY 3 Llyn Rhos Ddu to Moel y Don. 7.5 miles easy walking. After crossing the giant stepping stones at Braint River, the path traverses farmland down to the Menai Straits, with an optional visit to the Anglesey Sea Zoo and Halen Môn (Anglesey Sea Salt) Visitor Centre and Café. The views over to Snowdonia and Caernarfon Castle are a stunning backdrop to today's walk. Anglesey was the Druids' last stronghold. The next section passes an area thought to have been the site of a battle between the Romans and the Druids in AD61. The Druids were the priestly and learned class in the ancient Celtic society of Western Europe, Britain and Ireland. However, the Romans saw them as ferocious freedom fighters rather than pious priests. . Today's walk ends at the quiet little hamlet of Moel y Don. Day 4: Optional morning walk around the historical town of Beaumaris and castle (World Heritage Site) before your transfer to Holyhead Ferry Terminal for departure to Dublin in the afternoon. Pick up in Dublin Port by our Irish counterparts, who will take you o your accommodation in the Wicklow mountains. DAY 5: Glen Da Lough, the “Valley of The two lakes” (8. Miles) A circular route taking in some of the most spectacular scenery in Wicklow visiting an old Monastic Settlement that dates back to the 5th century. DAY 6: Trooperstown Hill and the village of Annamoe (9. Miles) Follow quiet country roads and lanes to the summit of Trooperstown with views across Wicklow and back to Wales. DAY 7: Transfer to Dubin port for ferry crossing back to Anglesey. Pick up and transfer from Holyhead terminal to car/station/ airport for departure. 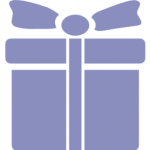 PRICE £585(Sterling) PER PERSON-BASED ON TWO PEOPLE SHARING. 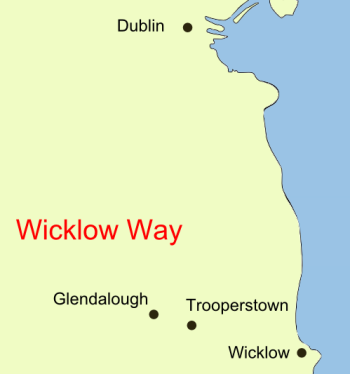 Please note: Our itinerary description is Anglesey and Wicklow but it can be reversed so that it starts in Wicklow. Included : all accommodations in en-suite rooms, full Welsh and Irish breakfasts, luggage transfer, pick up to and from path if the accommodations are not at the end of the walk, ferry tickets and back up. Packed lunches and evening meals are not included in the price but can be arranged. For solo walkers walking on their own, there will be an added charge of £30 per night. For those walking with others but wanting a single occupancy there will be a single supplement charge of £20 per night. Please note that this is a sample package and can be altered to suit the customer's preference. 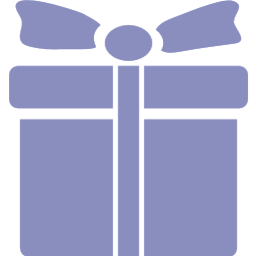 Click here to view all our other packages.